The way Vucevic is playing right now. He is losing on teams pursuing him. I like Kemba talent wise, and think he will only be better with talent around him with Doncic and Porzingis. But Defensively we will struggle. If we don't go for Kemba. I Would like to see us stretch Lee, so we increase our cap space. All three are great defenders. You see what Beverly is doing to Durant. What Bogdanovic did on Lebron last year. And Green always plays on the other teams best guard. They are great shooters. All 3 don't have an injury history, play a whole season. They all come from winning teams and are good character, hard nose, team players. Adds to the type of guys we have in Brunson, Powell, Kleber, Smith. Kawhi and Durant would be amazing but is unlikely. Brodgan, Middleton, Harris would be good additions but I don't see them leaving the Bucks and think harris will go back to the sixers. Avoid Butler, Cousins no matter what. I think they could easily cause locker room problems. I don't think we need 3 stars. You see what Portland does with two allstars, Toronto with one, bucks with one, Houston with two, etc. You don't need 3 stars like the warriors. Two stars and the good solid pieces around them. I agree Beverley and Bogdanovic are a great fit. Bogdanovic is a good enough defender and would bring top notch catch and shoot and he would be the perfect 3rd offensive option for the team. But instead of Green, I would use the remaining cap space for a tough big like Ed davis or Dedmon. A backcourt with Luka / Bev / Brunson seems enough crowded imo. I think that makes us a reasonable contender next year. If Jackson makes strides in the off season, I see him being a solid contributor. That is one scary lineup. Plenty of scoring. Would prefer more range ala green, but I do agree that a defensive minded 5 takes priority. When it comes to offense generation, the single biggest thing we can do is add range to the court. How many missed wide open 3s did we have off Luka’s passing? Huge opportunity for us here that does not require a 1 man 30 million dollar commitment. Yeah its case where we cant fill all holes/needs in one offseason. We need shooters, defense and some help on the boards. I like Davis, he can help. Really depends on his demands money wise and same for Dedmond. I personally rather of signed one of them over Powell extension. I like Brunson, just not sure he is fully ready to be a starter that can take us to the playoffs right away. And hopefully Hardaway can be a great sixth man giving us instant scoring punch off the bench (hopefully efficiently) Like Lou Williams, Crawford, Sabonis, Rudy Gay. Not true at all. If you look up his defensive metrics they are very good. And if you want visual proof, just have to look at how he did in the playoffs against Lebron. He's a consistent shooter every year, plays every game, improved every year. Not a max contract guy. That's BOJAN Bogdanovic, not BOGDAN. Bogdan plays for the Kings (unrelated). Last edited by Male30Dan; 04-19-2019 at 09:07 AM. Ya'll are confusing me....are you talking about Malcolm Brogdon from the Bucks, or Bogdan Bogdanovic from the Kings, or someone else? Last edited by SMC0007; 04-19-2019 at 09:25 AM. If he resigns from Milwaukee, that's great news as he'll be available. Resign or re-sign? Malcolm Brogdon, Bogdan Bogdanovic, or Bojack Horseman?? WTF conversation is going on here??? Last edited by Underdog; 04-19-2019 at 04:08 PM. Totally agree. Davis is a hugue rebounder (like one of the very best) but doesn’t bring much more. Dedmon brings fair rebounding, steals / blocks and decent 3pt shooting. But plenty of other teams will be able to pay him, especially after this playoff series... Bev’s value might be up higher than we can afford, depending on which other moves we make. My point is that I'm sure Milwaukee will match any offer he is offered..so he won't be available most likely. That doesn’t sound like Vucevic and 32 year-old Dragic to me, but what do I know. I think the fit is perfect with those two guys though if they can make the numbers work. OK, defense is still meh, but the offense would be beautiful. Unstoppable, really. If you want to get a certain level of proven talent via free agency, then you look at players older than 28. Because no one reaches UFA status before. Its the rookie contract and then the first extension with the same team. We got lucky to get Porz via trade but we also blew all our assets. We wont get a main piece via FA that is in the same age range of Luka and KP. Because the proven allstars etc are older and the player in the same age range are less talented/less proven. I think Nelson meant that they wont sign just old win now guys. But that also dont mean they wont sign 28-29y olds like Vuc or Kemba. 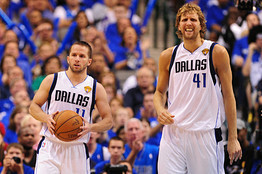 Hell, Dwight is just a few months younger than these guys. Last edited by sefant77; Yesterday at 10:46 AM. We got lucky to get Porz via draft but we also blew all our assets. We wont get a main piece via FA that is in the same age range of Luka and KP. Because the proven allstars etc are older and the player in the same age range are less talented/less proven. Age with with Kemba or Vuc shouldn't even be a thought. They are in their primes. I’m still thinking about the potential Powell extension and losing my mind. Kleber can do probably 80% of what he can (maybe closer to equal than that) and costs how much less? I agree with this. I think Kleber is a better defender and shooter, Powell is more athletic and better around the basket. But Kleber is just starting out and can improve from what he is now. I think Powell's potential is maxed out now. Kleber is less than 2 million Salary. Rather Powell be left gone and use that money towards a big like Dedmond. I think this is my biggest issue with the potential deal for Powell. I feel like Maxi has a higher ceiling and they play the same position essentially. Maxi is a much better defender and long range shooter, too. Man y’all really gotta stop bitching about Powell. It’s nauseating. Y’all can keep Vucecic....I’m not wasting money on him. Eh, part of me is kinda glad he is playing crappy in the playoffs. Makes him more attainable. Doubt the Magic max him out. I don’t know if they will but someone will. Bamba is the future. I hope they aren’t looking at Vuc not just because of this series but it’s a part. The league is not moving towards having two big guys like that on the floor at the same time. Look at teams that do well in playoffs. Also think the paint would be clogged up. Mavs would get regularly destroyed on PnR up top. Especially for the type of money Vuc will be getting. Last edited by Melonhead; Today at 12:44 AM. Vucevic is a horrible defender, worse than Powell, even... Not sure what he’d bring to this team that you couldn’t get from someone cheaper. him in all of his PO games - I think I'd pass. Cheaper options are out there.